CHICAGO — Countless breast cancer patients in the future will be spared millions of dollars of chemotherapy thanks in part to something that millions of Americans did that cost them just pennies: bought a postage stamp. Proceeds from the U.S. 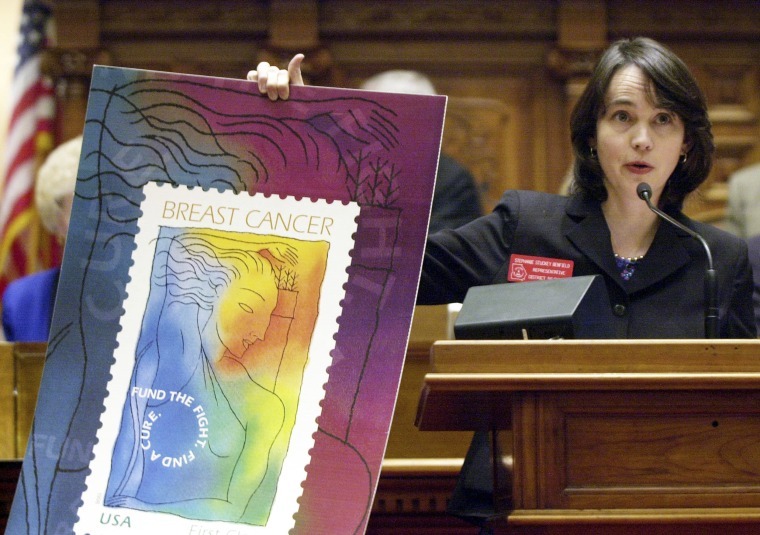 Postal Service’s breast cancer stamp put researchers over the top when they were trying to get enough money to do the landmark study published on Sunday that showed genetic testing can reveal which women with early-stage breast cancer need chemo and which do not. The stamp was the nation’s first “semipostal” — a U.S. Postal Service stamp sold at a surcharge to raise money for a cause — when Congress passed a measure enabling it and then-President Bill Clinton signed it into law in 1997. It was first issued in 1998 and has been reissued multiple times since, and has raised more than $86 million for breast cancer research. It shows a woman with an arm raised, in a position meant to portray breast self-examination. When first issued, it cost 40 cents instead of the usual 34. The extra 6 cents went for research — 70 percent to the Cancer Institute and 30 percent to the Department of Defense. Over the years, the Cancer Institute has used its $59.8 million in proceeds for studies trying to improve early detection and to determine which cancers are most dangerous and need heaviest treatment and which are less so. The two most recent studies it is funding look at tomosynthesis — a newer breast imaging technique — versus standard-of-care 3D mammograms, and research on whether weight loss impacts breast cancer treatment and outcomes. “I think it’s been well spent,” Singer said of the stamp proceeds. The study published on Sunday, on which early-stage breast cancer patients can forgo chemo, is by far the most impactful so far. “We just cannot afford to do these large clinical studies anymore. You’re never going to see these kinds of trials from the drug companies,” because what is being tested might result in less use of their products, Brawley said.